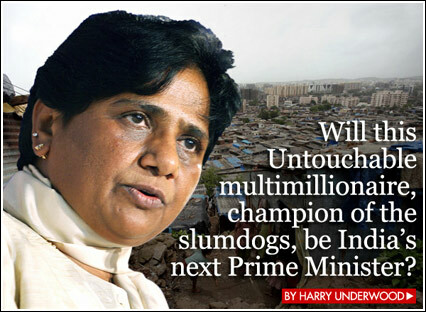 megalomaniac mayawati and her shameless PSO. 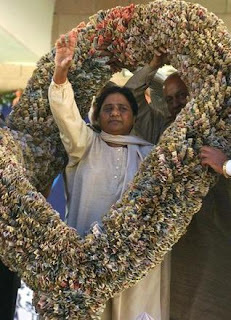 padam singh, president's gallantry medal award winner wiping out the dust of mayawati's sandal got caught in the camera. what a shameful act? is mayawati the chief minister or a tyrant, barbaric queen of uttar pradesh? such a low job is done by her own personal security officer, who is incharge of her all security details. how can a man with such bravery award winner can do such a low hold job, which her own paid maid could refuse? 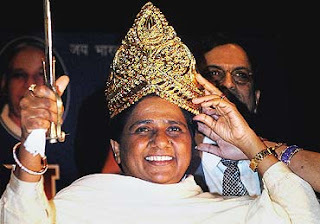 if anyone starts looking to the scams of mayawati, it will be never ending list, from Taj corridor, her party's symbol statue of 2000 crore to her said (22crore or 5.5 crore whatever) 1000 denomination's note's necklace. each and every scam she does just shows her megalomaniac nature. the most corrupted politician the constitution of india ever would have met. such a low profile jobs? she represents dalits, who are now in india are given the highest priority, in each and every field of the government and non government sectors. we are still happy with their quotas. in a sense they sometimes seems sensible to give away the quotas to them. but now it feels regretted that why at all we selected a dalit, who by any how should not be treated like a dalit. she is mayawati hoping for the prime ministership candidature and wants to be a future prime minister. i think if such a lady is by anyhow get that post of prime minister, it will not take moments to scramble the whole constitution. whole country will bleed on her prime ministership. i have never heard of a good job performed by that lady. she is obsessed with power money and status. she really seems to be the most hateful minister of india. in this post i have given all the gabbling i had in me. 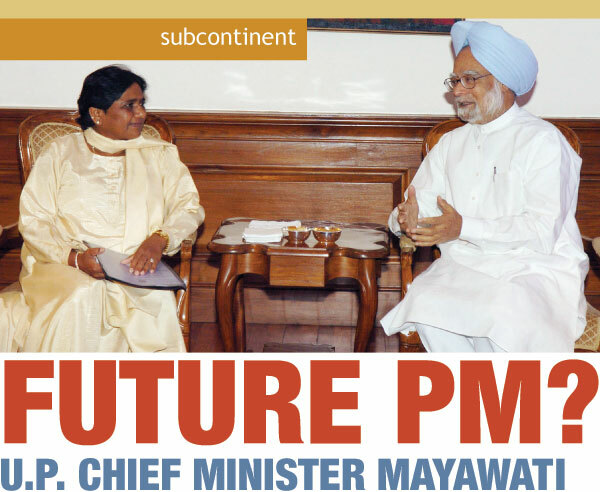 please mayawati please be kind enough to your people, they have taken a lot of pain to elect you and has many expectations from you. please be generous and heartful. 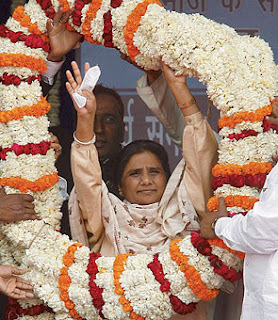 MAYAWATI TRY TO BE A GOOD WOMAN. PLEASE SHOW THE COUNTRY, WHAT A WOMAN CAN DO? IT IS SAID IF YOU CAN DO WRONG THAN YOU ONLY CAN DO THE RIGHT. YOU CAN DO IT. 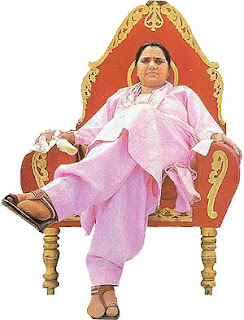 YOU HAVE ENOUGH OF EVERYTHING, YOU HAVE LED A LIFE OF QUEEN TILL NOW, AT LEAST BY NOW YOU SHOULD CHANGE THE FATE, YOU MIGHT HAVE THOUGHT FOR THE PEOPLE OF YOUR STATE. AND IF THAT COULD HAPPEN, I'M SURE YOU CAN PROVE EACH OF MY LINES AWRY AND WOULD SHOW INDIA THE MOST SUCCESSFUL PRIME MINISTER, INDIA EVER HAD. I BELIEVE YOU, BUT NOW I'M TOO MUCH HURT. IT'S A KIND REQUEST FROM THE CITIZEN OF INDIA. I MIGHT HAVE USED THE FREEDOM OF EXPRESSION TOO MUCH, BUT I THOUGHT IT'S THE NEED OF HOUR.